Ferrets will never cease to entertain you with their antics. Providing a variety of stimulating and safe ferret toys is a great way to keep your ferret entertained and happy. 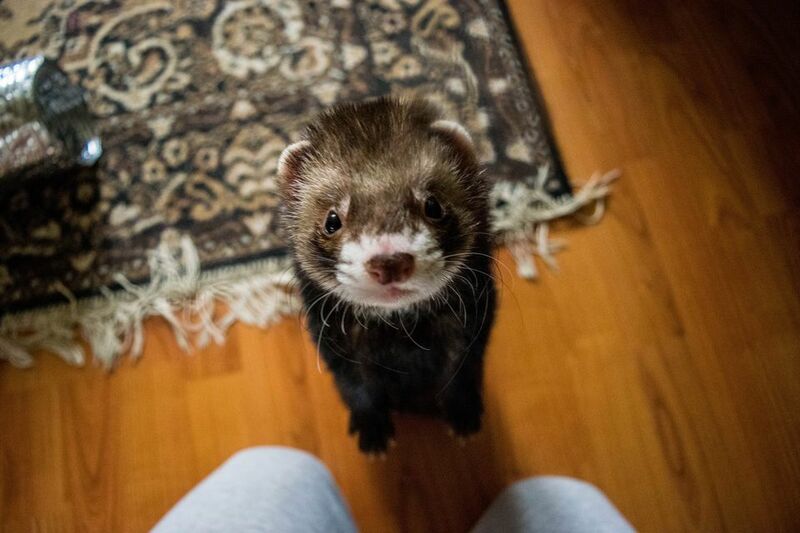 Ferrets will play with almost anything, but when selecting toys for ferrets, it is important to pick toys that are durable and won't pose a safety hazard to your pet. Dog owners may be familiar with the Kong, and now there is one designed for ferrets. It is a very sturdy hollow rubber toy. It bounces and moves in unpredictable ways, and can be stuffed with your ferret's favorite treat to become a good distraction tool. 3-Pack of colorful bouncy rubber balls with paw shaped cut outs so ferrets can grip them (plus cute ferret faces adorn the balls!). Each makes a different noise. These are a great deal! This cute and inexpensive toy (comes in a variety of animals shapes) has a pull string that makes it vibrate, as well as a bell inside. The combination of movement and noise should be enough to entice your ferret into a game. Ferrets love tunnels and this crinkle tunnel has the advantage of making irresistible noises when your ferret runs through it. About 2 feet long with a peek-a-boo hole in the middle. This is a fun interactive toy for playtime, though since it is on a string, it is best only used under supervision. It is simply a furry thing on a string with a bell, which you can wiggle around to entice your ferret into a game. The downside: the stick is not sturdy, so skip the multiple sections and just use the last section of the stick as a handle. This fleece toy is a decent size (nearly 6 inches across), but the shape makes it easy to grab and play with. 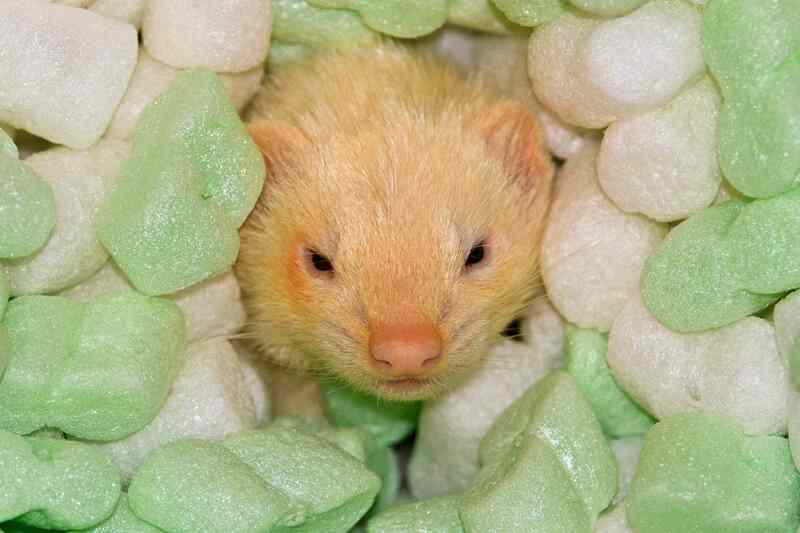 It also contains a bell and makes crinkly noises, which makes it a whole lot of fun for most ferrets. This toy is cute and offers dual function as a cozy sleeping spot and a multi-tunnel toy. Made of soft fleece, the body of the octopus is a great hiding hole (about 10 inches diameter), while each of the 5 foot-long arms (technically isn't an octopus, I guess) are great for tunneling through, hiding in, and playing Peek-a-boo from as there is a hole halfway down each arm as well as at the end. Miniature versions of football, baseball, soccer, or tennis balls (2 assorted balls per pack; unfortunately can't choose specific balls). These cute balls have soft fleece exteriors and bells inside, so are easy to carry and fun to play with. This is meant to be a sort of starter kit to which can add on other components, but even as a standalone it makes a nifty little ferret playground. The "Bubble Wave" tubes are a good size for ferrets to wander through and play in and can be configured as you like. This kit contains a Roll About Ball, a Bubble Wave Tee, four Bubble Wave Elbows, two Bubble Wave Tubes, and 6 Connectors.